Ballots must be submitted online by Tuesday, Sept. 2, 2008. Recording Studio: Million Dollar Sound! This is a great entry from Worth 1000. LOVE IT!!!! Wille Elfson By LucidPixels for the Middle Earth 2006 contest. Julie Jackson is turning Japanese, I really think so! 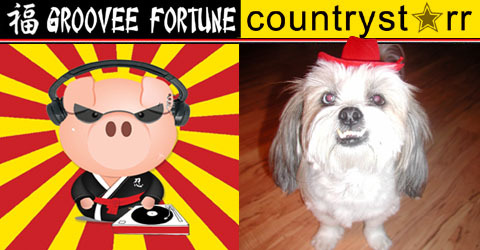 This is the first year Groovee Fortune has given away a web page. It’s so exciting to have crafting powerhouse, Julie Jackson as a judge for the Groovee Fortune Web Crafty Challenge. Not only does she do the coolest cross stitching in the world, but she recently launched her new company KITTY WIGS. Julie racked up tons of press with Subversive Cross Stitch. I’ve already seen Kitty Wigs on Anderson Cooper, Graham Norton (w/ guests: Sharon Osbournce and Bon Jovi) and in Business Week; but newest praise comes from the East and it’s COOOOOL!!! Kitty Wigs will be in the pages of Harpers Bazaar JAPAN in April!!! Imagine Julie Jackson, laying around on a giant pile of pillows cross stitching some dirty about your grandma, when one of her helper monkeys brings the new issue. Yes he is wearing a wig! The kitties go wild wearing an array of wigs & gather around as she reads Harpers aloud. Hell, people are already putting Kitty Wigs on dogs! Come back Saturday, March 8 to see who wins the Groovee Contest. Thanks Julie!!! !